Thanks for coming over to my place! If you're twisting your way through the blog hop, you've arrived here from Diane's place. If you want to start from the beginning, you can go to the Fitztown Challenge Blog. We've got something special going on this week! As usual, there's the current challenge to play along with. It's a CELEBRATION theme and for a very special reason! Celebrations can include birthdays, anniversaries, new baby, new home, new job, retirements, weddings, graduations... you get the idea! Fifty two weeks ago today, Fitztown Challenge Blog launched its very first challenge! Woohoo! So put on your party hat and fancy duds, shine up your party shoes and come celebrate with Fitztown at the CELEBRATION Blog Hop! So much has happened since the beginning. Fitztown had some growing pains and we continue to learn and grow. The collections in the store have also continued to expand! The Design Team (DT), Guest Designers (GD) and I want to show you something from ALL the collections. After all, Fitztown is not all about fairies and teddy bears! Fitztown has SO MUCH MORE to offer! Each DT member and GD is featuring a project from different collections through out the store. Be sure to visit all of them so you won't miss out on what's available! In the mean time, we want you to party down with us! We've got some special prizes to make this a fun celebration! Keep reading! When I lived in NH, I will not ever forget the Monday after the premiere of Friday Night Lights. I kid you not... some of the guys were waiting for me at my desk to ask me an all important question. Them Northerners wanted to know if we Texans were really like that! What can I tell you? I had to confess that we are! lol Ssooo... anyway... when our teams make it all the way to the top... we celebrate big time! The red and black are my high school colors, Coronado High School and their mascot is the mustang... horse... not car. Also, red and black are the colors for Texas Tech University and their mascot is ... kinda hard to explain ... but you can have a look here... cause really... I just cannot explain it. 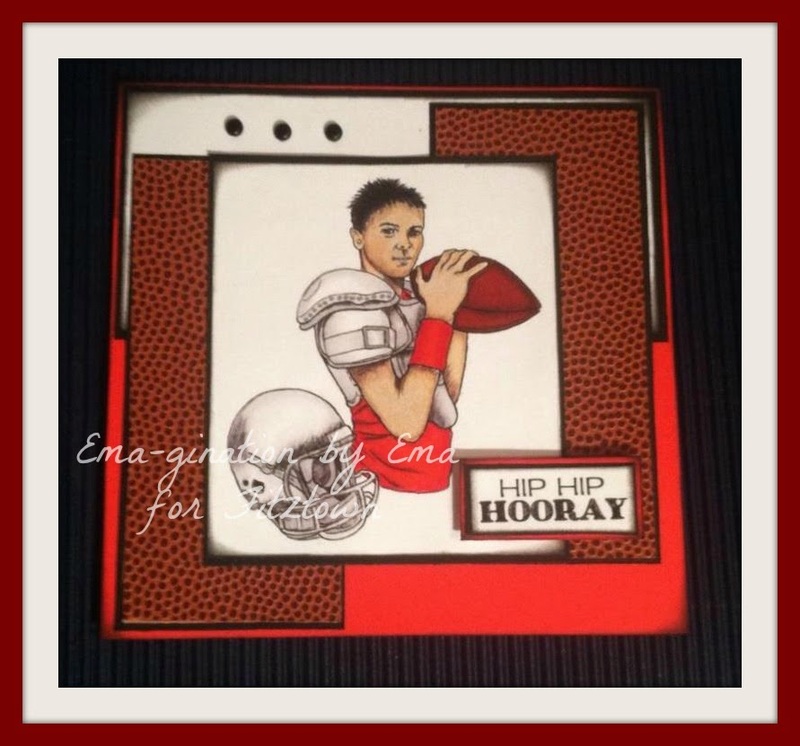 Hiding in My Craft Room: HIMCR #150 - Let's Hear it for the Boy! Now, let me finish telling you all about the blog hop! Along with having the usual winner and TOP 3 for the challenge, there will be two additional prizes! Random.org will be used to determine prizes for the blog hop. A name will be drawn from comments on the Fitztown Challenge Blog original post for a TWO-DIGI prize. Plus, there's a freebie again and to win the freebie, all you have to do is dance on over and leave comments on the DT's and GD's personal blogs. A name will be drawn from all the comments on their posts between now and Saturday, May 31st. You can get a look at the freebie over at the Fitztown Challenge Blog. To win the FREEBIE, a name will be drawn randomly from all comments left on the DT's and GD's personal blogs. So be sure to shimmy, do the jig or tap dance your way over to each blog and leave some love before Saturday, May 31st, midnight, USA EST! Winners for the blog hop will be announced on Sunday, June 1st at 6:00 PM USA EST. Next stop is at Hazel's blog so strut on over there!! Don't forget to leave comments along the way for the freebie! Absolutely love this card! The textured cardstock is wonderful with this image. Very nice Ema. Love the image and of course the texture you added. Wonderful card !! 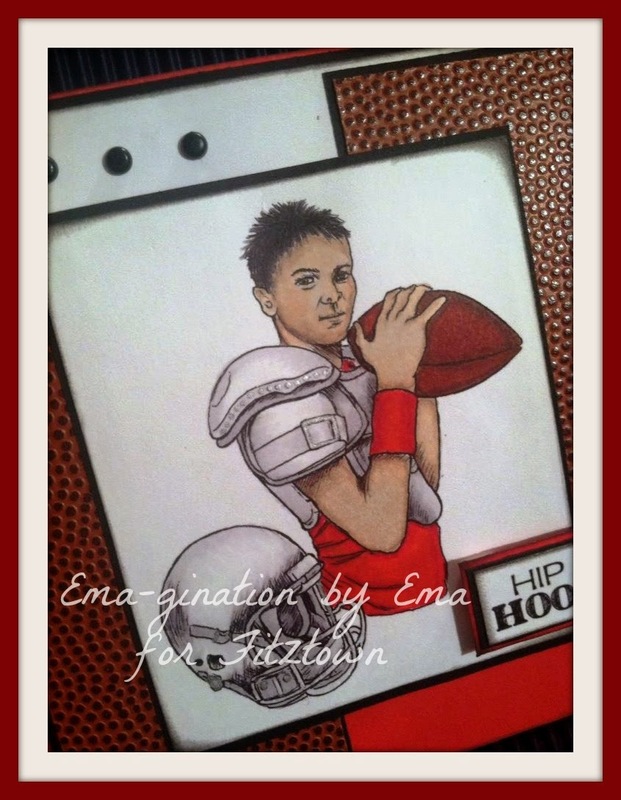 This is a super card Ema - great for a grown up 'boy' or for a little boy! I loved reading about Texas and although I didn't quite understand everything, I shall be checking out the links you so kindly left for us. Brilliant. Thank you for entering the OSAAT challenge this week, lots of luck! Wow! Love this! Super cute and perfect for any boy! Thanks for joining us at Scribble & Scrap this challenge. 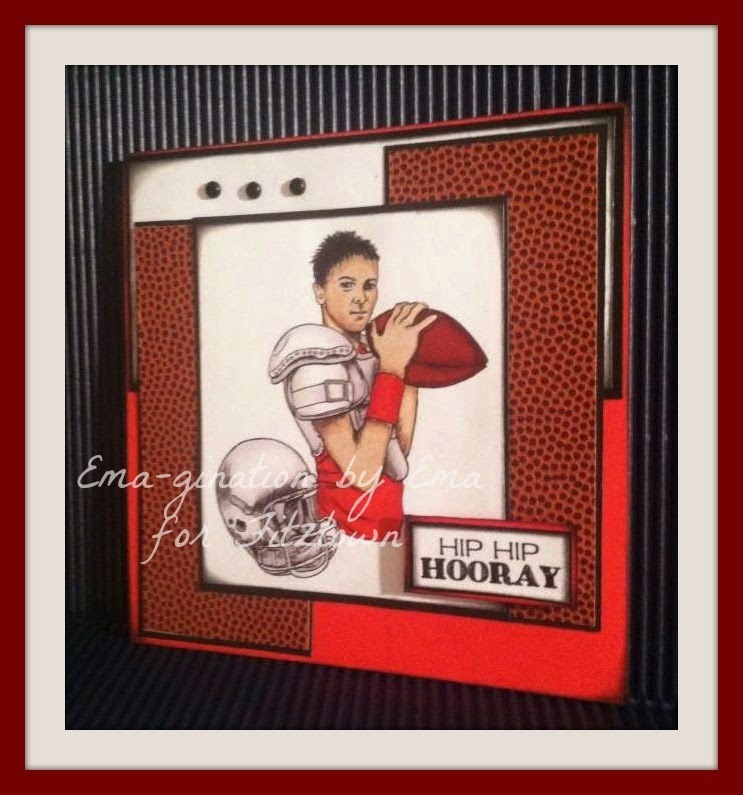 Wow...What super cute card that would be GREAT for any sports lovin' guy. And I love the papers you used. Thanks for joining us at Hiding In My Craft Room this week...Hope you join us again soon. 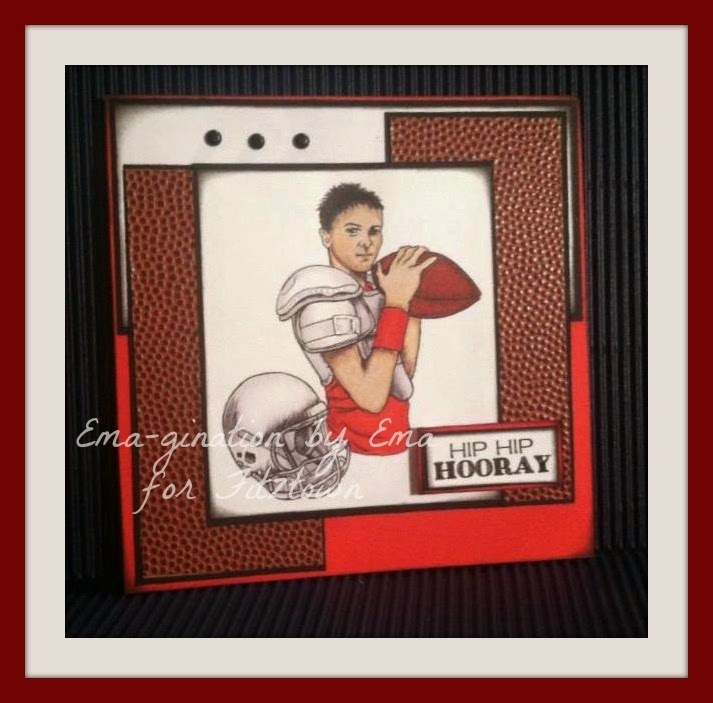 Awesome card.Thanks for playing along on our 200th blog challenge at The Corrosive Challenge Blog! Good luck! Hugs!